Police sappers disarm two pipe bombs brought by terrorist to blow up military court in Samaria. 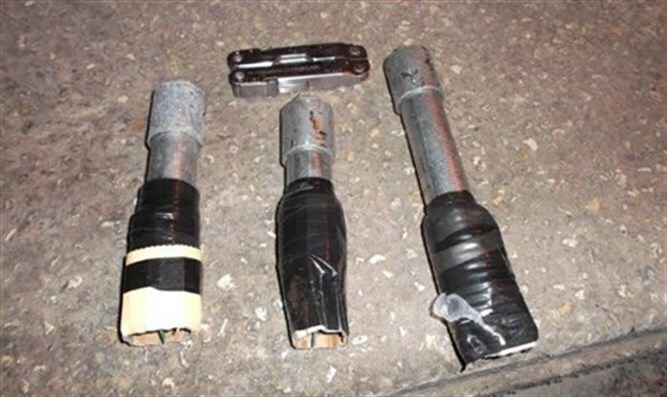 Police sappers disarmed two pipe bombs which were brought to a military court in Samaria Thursday. Earlier, Border Police and army police officers arrested a suspect arriving at the Samaria military court near Kafr Salaam armed with a pipe bomb. The suspect raised suspicion when he passed through a metal detector, which went off. The officers searched him and found the bombs hidden in his clothing. The 17-year-old terrorist, a resident of the Jenin refugee camp, was taken for questioning. Security forces confirmed that the suspect had sought to detonate the bombs inside the court building. When police sappers arrived to disarm the pipe bomb they discovered that there were two explosive devices. The police stated: "We again see attempts by terrorists to smuggle pipe bombs into courts the the aim of attacking those locations. Also on December 17, Border Police officers and the Military Police arrested a terrorist who also attempted to smuggle two pipe bombs into the courtroom. The security forces will continue their activities to eradicate, prevent, and stop terrorism."